Stop the impending aggravation of the asylum laws! After the extension of the list contained within the so-called “regulation of safe countries of origin” in autumn 2014, another aggravation of the residence act is being planned now, which has the potential to transform nearly every asylum seeker into a criminal. While Pegida is holding racist demonstrations, the parliament nearly fulfils some of there demands with this upcoming law. In future, deportations shall be carried out harder and more consequently. Criteria for imprisonment are extremely extended. Additionally, the possibilities of imposing entry- and residence-bans are to be widened. Especially „tolerated“ people and refugees subject to the Dublin-procedure are facing these extensive repressions. We oppose the law draft, slated to be implemented in June 2015. Through this daily demonstration we want to make this subject more visible! The tigtening of the law calls for more than an usual demonstration. By means of daily presence, workshops, cultural programm and information for pedestrians we want to reveal that this law will make life for refugees even worse than it already is! For our action to be succesful we need you! Say no to the new law draft by the federal government for the “re-definition of the right to stay and the termination of stay”! Flight is not a crime! For a community in solidarity without exclusion! Pas de durcissement des lois sur le droit de séjour! chaque jour de 14 -19 heures. vient justement satisfaire leurs revendications. rend difficile la vie des refugié(e)s! Pour le succès de notre action nous avons besoin de votre soutien! Fuir n’est pas un crime! Gesetzentwurf einigen der Forderungen von Pegida entgegen. werden, unter anderem durch eine massive Ausweitung der Abschiebehaft. Dublinverfahren sind von diesem Verschärfungen betroffen. soll. Mit unserer Mahnwache wollen wir das Thema sichtbarer machen. Damit unsere Aktion erfolgreich wird, brauchen wir eure Unterstützung! Übernehmt Schichten, bietet Workshops an, macht ein Konzert, spielt Theater, usw.! « zur Neubestimmung des Bleiberechts und der Aufenthaltsbeendigung »! Für ein solidarisches Miteinander statt Ausgrenzung! KüfA and Info Event on the tightening of the asylum law! Good food with peanut sauce, beans, rice and dought balls. 9pm: Infos about the law and actions against it. « tolerated » people? For people affected by the Dublin-legislation? imprisonment, working ban, re-entrance- and residence ban? KüfA und Infoveranstaltung zur Verschärfung des Aufenhaltsgesetzes! Dienstag 24.03.2015 @ Friedelstr. 54. Ab 20 Uhr: Lecka KüfA mit Erdnußsoße, Bohnen, Reis und Teigbällchen. 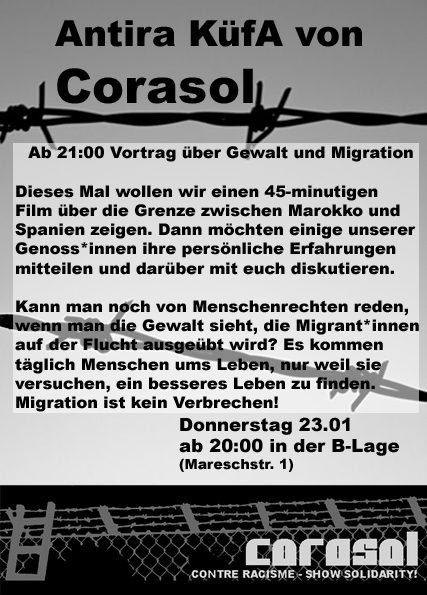 Ab 21 Uhr: Infos zum Gesetz und anstehenden Gegenaktionen. Aktivist_innen die anstehenden Gegenaktionen im April! Bleiberechts und der Aufenthaltsbeendigung » abgestimmt. [Come Together]: Ma 24.03 20H: discussion avec une avocate / cuisine pour tous: Pas de durcissement des lois sur le droit de séjour! lois sur le droit de séjour! Mardi 24/03/2015 @ Friedelstr. 54. 21 heures: Information sur le loi et des actions contre ça. actions contre ça en avril! in the ND-Gebäude, seminar room 7, in order to discuss possible actions and how we can support each other over the next few months. After last autumn’s successful extension of the list of “safe countries of origin” in order to deny asylum seekers from the balkans, the german government is planning to further toughen laws for granting asylum in the spring of 2015.
tightening of deportation rules is the focus of this new bill. Germany by means of a « safe third country ». Moreover, people who are arbitrarily determined to be flight risks (Anm. « imprisonment program » waiting to happen. of their « legal position ». Small comfort, seeing as it should be a matter of course that those living here in cramped homes for asylum seekers for a number of years (or even decades) should finally receive permanent residency status. has to be stopped by any means. order to be be enacted that same month. increase the pressure on those in power. stay and termination of residency ». This bill has to be opposed – by any means necessary! Einladung zum Bündnistreffen « Asylrechtsverschärfung stoppen! um 19 Uhr ins ND-Gebäude, Seminarraum 7. Zu einem großen Bündnistreffen ein, um zu besprechen, was wir tun und wie wir uns gegenseitig unterstützen können. werden, ist eine Unverfrorenheit, die es zu verhindern gilt. Maßnahmen zu verhindern. Macht mit! Seid kreativ! Mischt Euch ein! Lasst nichts, aber auch gar nichts unversucht! Aus diesem Grund laden wir alle Berliner Gruppen am Montag den 23.03. Dieser Gesetzentwurf ist abzulehnen! Mit allen notwendigen Mitteln. [Come Together] Lu 23.03.2015 19H: Invitation à la réunion pour la formation d’une alliance pour la semaine d’action You can’t evict a movement! You can’t evict a movement! Non au durcissement du droit d’asile! We invite all interested parties to our next meeting on the 23th of March at 19:00 pm in the ND-Gebäude, seminar room 7, in order to discuss possible actions and how we can support each other over the next few months.